You can also set the four LED's and turn on the rumble motors. The USB PS3 Dualshock Controller software for our USB Host board allows you to easily read the analog joysticks, accelerometer, button pressure values and all the buttons from a PS3 Controller. You can also set the 4 LEDS and the rumble motors. Output from the host board is via serial (mainly for testing) and also via I2C. 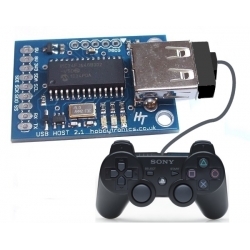 Now you can easily interface this versatile PS3 Game Controller into virtually any Microcontroller project. SERIAL turns on or off the output of serial data when the PS3 controller is plugged in. Data is output in ASCII text format. Turn it on for testing the PS3 controller or if your want the serial data. Turn it off when using I2C communication to save on processing. As mentioned, there are two ways to obtain the PS3 data from the USB Host board. Either by simple serial output or by using I2C communication. Although the serial output is meant primarily for testing the controller, the HEX output has a useful purpose if you want to transmit the data wirelessly (e.g. to control a UAV or robot) as it can be fed directly into an XBee radio (or similar) for easy transmission. It conforms to the same format as the I2C data table shown below. Joystick and pressure outputs are comma delimited, whilst the button presses are not. each line is terminated with a CRLF. The data is in the same format as the I2C data table shown below and transmitted as single bytes. Each transmission is prefixed by characters "PS3" and ended with CRLF. I2C data can be read in the normal I2C manner using the following register values for obtaining data. Data can be read on one complete go or read individually. There is a link to an example Arduino program for reading the data at the bottom of the page. Registers for setting LEDs and Rumble motors.. There may be some different non-Sony controllers available but the one i bought from ebay was advertised widely by a number of vendors and represents a typical cheap controller. Check with the vendor before purchase that it has all the functionality.